First of all, I just want to say THANK YOU to the community! 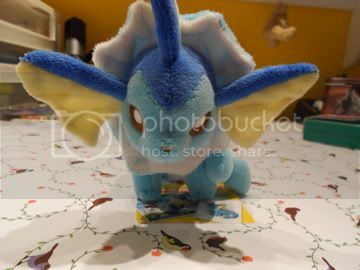 My grail, the Snorlax DX Pokedoll, popped up on Y!J this week, and so many people took the time to let me know that they'd seen it and send me the link to the auction! I was so touched that people remembered and thought of me, and it really means a lot to me. Thank you, pkmncollectors!! :D Seriously! Which brings me to my next question, out of curiosity: Is the winner of the auction someone else in the community? :O I'm hard-pressed to think of someone outside of it who'd want to spend that much on a pokeman plush, so if it was you, speak up! I'll feel a little better if I know it at least went to someone else in the comm. who wanted it as badly as I do. sales post and Singapore event report! Hey everybody! I'm back with new stuff on auction/sale this week. 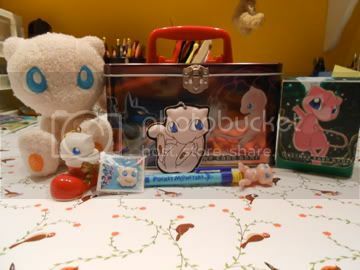 Items on auction include a 2007 Pokemon Center balloon dice bag, Ichiban Kuji Legendary Dog foam figure keychains, and various roller stampers. Auction ends Friday 18 May, 10PM EST. These are on top of other plush, zukan, battrio, bobblehead figures and more on sale! Click the pictures or banner to proceed. Also, an event report - the Singapore Isetan Pokemon Pika Pika Carnival! 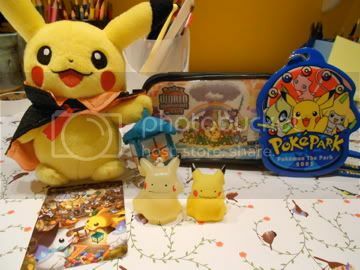 Part of the collaborative effort between Isetan Singapore and their Japanese counterparts (which correspondingly have distribution links to the Pokemon Center), a small event hall was used to house a few mini-game stations as well as a small selection of Pokemon Center merchandise and English TCG cards. While nowhere as exciting as the actual Japanese Pokemon Centers, I must say it was a surprise to see the mini Pokedoll keychains on sale. As some of you may know, I was present on opening day, and the following pictures reflect what was available then. By the third day, stock had considerably dwindled - the goods sold out darn fast! I've been unable to access my account, due to forgetting my password. Hey guys, just me with four new plush! 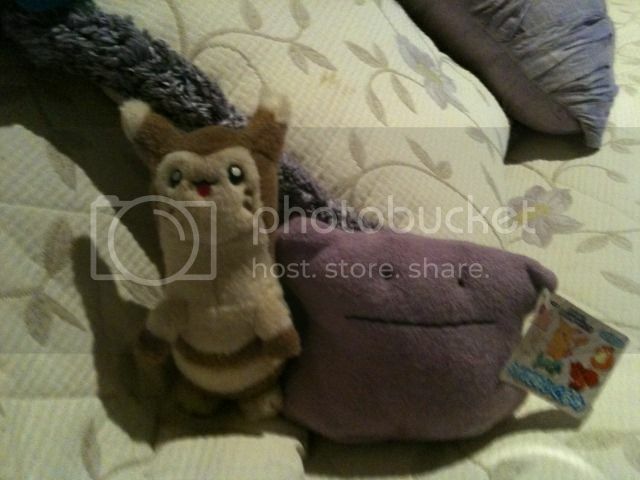 And a reminder for the Auctions on my Banpresto Ditto and Tomy Furret! I've decided to end the auctions early, so now they'll end on the 16th instead of the 20th! Click the pic to get to to my auctions! Well that's all from me, do ask questions if theres any specific accessory you are looking for as there are more stuff that I didn't post up. Custom Shiny Tomy Collection Mini Update! Hey Guys Today I have a special update I was waiting for this package for a while now. I had commission zenity for these custom shiny repaints and they are finally here and look how great they came out. I am so happy with zenity work I just love all the details she puts in the repaints. I know she was really busy when i asked her but she still said yes to me man I could not of found a better repainter. But I know she is busy so I am going to be looking for other painters out here to maybe i can commission since Zenity is busy so it will be a while before I can get her to repaints other for me anyone can show me their work? So maybe i can commission from you in the future? 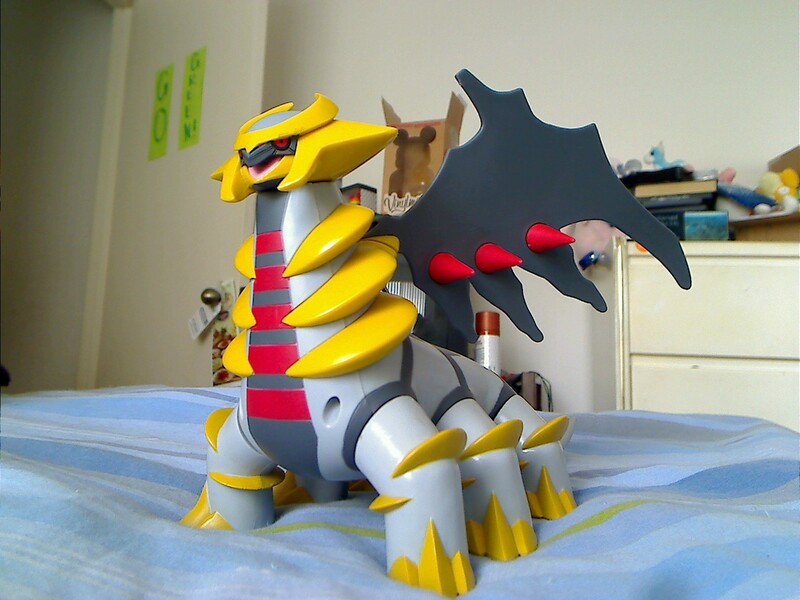 Big Jakks Giratina Figure Auction + quick want! It's the big (and I mean BIG) Jakks Giratina Figure! Why hello their everyone, I doubt anyone remembers me, I used to be on here almost every day until I took a break and put my pokemon collecting habbits on hold for over a year to work on another collection of mine. Well I'm back and I have some fun collection photos, some of these are a bit old and I have collected a bit more since these have been taken. I am currently away at the moment but when I get home soon I will have some up to date shots. Hope you enjoy. I like to buy myself bday gifts...so let me buy these from you! Well I've had and account and lurked on PKMNCollectors for over a year, but now that I'm actually buying from the community I decided to introduce myself. ^_^ My username is two years old, but it's outdated so you can just call me Cassie instead. I'm a sophomore in high school and I play both the VG and TCG for Pokemon at the TPCi events. If you end up going to the US Nationals feel free to say hi! Vulpix merch - Out of all my things I collect Vulpix the most, I'm interested in any TCG cards, Stickers, and plush you may have! I'll probably eventually ask for a custom, seeing as there is no chibi version of Vulpix :( The only Ninetales merch I'd be interested in would be the cards. Swablu line merch - Along with Vulpix, Swablu and Altaria are probably the three things I'd say I "collect". I love them all so if you have anything please let me know! TCG Pokemon Sleeves - I love Japanese sleeves, even if they're impossible to use because they break, so I'd love to just see all the different artwork and possibly buy some! I also wanted to know if there was a database of any kind with the Japanese sleeves? Charms - I don't own any yet, but seeing all the collections on here makes me want to start my own. I prefer pokedoll like ones or pokemon charms on my list of collecting. I REALLY want swablu/altaria/vulpix right now. Hopefully I can share my own collection with you all soon! 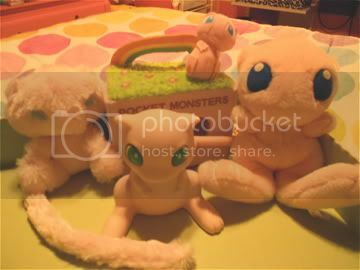 Including Mewtwo, wich i only have mine, but if its for sabrina or elekid, i can trade it. Thank you! Reminder for my auction that ends tomorrow night (Monday)! Whole lotta items at very low or starting bids! 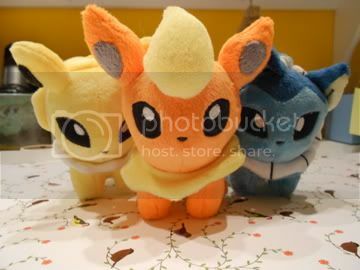 Eeveelu plushies, Mews, Xmas Ornaments, Rare Pikas, Dittochus! Phew! That took ages; I need a holiday. Errr; where's my holiday hat?